Daniel Bell was born in Nottingham and grew up in Edinburgh, where he began violin lessons at the age of four. He later studied at Chetham's School of Music in Manchester, the Curtis Institute of Music in Philadelphia, and the Cleveland Institute of Music where he graduated with Academic Honours. He has performed as soloist throughout Europe and Japan, and at major British venues such as the Cheltenham Festival and the Wigmore Hall. His concerts have also been broadcast on BBC Radio 3. His Purcell Room debut was described by The Times as "immediately and irresistibly engaging" and by The Independent as "magnificent". Early experience as concertmaster came with an invitation from Claudio Abbado to lead the Gustav Mahler Youth Orchestra in 1998. Since 2000 he has lived in Berlin where he was a member of the Petersen Quartet from 2000 to 2008, playing regularly in the world's music capitals such as New York, London, Berlin, Paris, Zurich, and Salzburg. The Petersen Quartet also made many acclaimed recordings, several of which won major prizes such as the Echo Preis and the Preis der deutschen Schallplattenkritik. In 2008 he was a jury member in the String Quartet category of the International ARD Music Competition in Munich. From 2004 to 2008 he played as a regular guest violinist in the Berlin Philharmonic, where he became a full-time member from 2008 to 2010. From 2011 to 2016 he was a member of the renowned Henschel Quartet in Munich, with concert appearances in musical centres throughout Europe, America, and Japan. 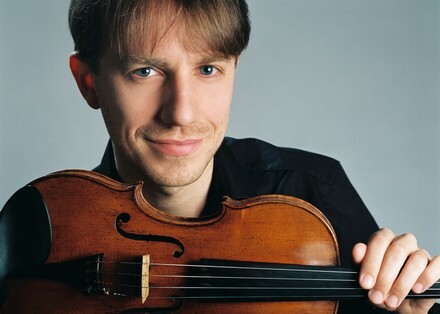 In 2013 he was appointed 1st Concertmaster of the Essener Philharmoniker, and is in frequent demand as guest concertmaster with eminent orchestras in Germany and the UK. Daniel Bell plays a violin by Nicolo Amati, Cremona.